Do you want to minimize the time of tweeting your newly published posts on Twitter? So, today I am writing an article which is going to help you to add automatically feed posts to Twitter. We know that most of the users take it annoying to share feeds on twitter for each post yet it is important too. That means we cannot neglect the twitter, as social media is very much crucial in blogging. Therefore in order to minimize that effort we are going to share a guide which will help you that how to auto-feed blog posts to twitter. First of all, Sign up for TwitterFeed.com or if you already have that account then simply sign in. After signing in, you need give name for your Feed and insert your Blog’s URL. Now you need to click on Advanced Settings. 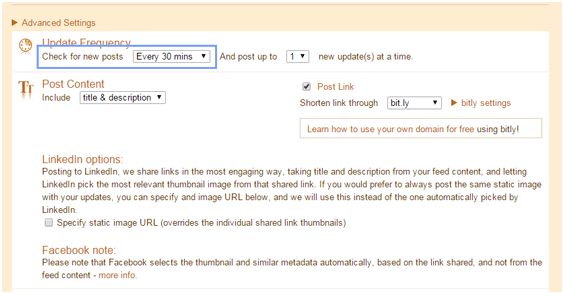 Then you need to set the time for Twitterfeeds to check your blog for new updates to auto-feed blog posts accordingly. You can set the time under Update Frequency section in front of Check for new Posts Every then set time. You can also add keywords in advanced settings tab and ones you are done, click on Continue. Now you need to click on Done. 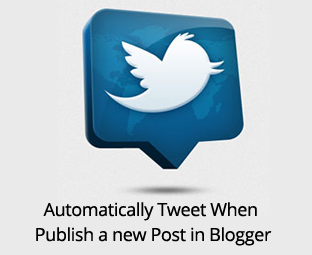 Now whenever you’ll publish new article on your blog then it will be automatically posted on twitter. So, this was our tutorial to auto-feed blog posts to twitter. We are sure now your work of manual posting on twitter is minimized or almost finished. If you have any queries related to this article then lend your queries in the comment box. We shall assist you in your queries. Was it helpful? If it was then don’t forget to share this with other bloggers too. You may never know that your share may help any of your friends out there who is searching for the same stuffs. Is there any way to include hashtags with the automated tweets?